The White House on Friday denied an Associated Press report citing a draft memo that proposed the deployment of up to 100,000 National Guard troops to detain immigrants who are in the United States illegally. White House press secretary Sean Spicer told reporters on Marine One that the report is "100 percent not true." "It is irresponsible to be saying this," Spicer said, according to a pool report. "There is no effort at all to round up, to utilize the National Guard to round up illegal immigrants." Spicer said the draft memo cited by the AP was not a White House document. "I wish you guys had asked before you tweeted," Spicer said to an AP reporter, who noted that the media group had requested comment multiple times prior to publication. Less than 15 minutes after the report's release, Senior Assistant White House press secretary Michael Short took to Twitter to shutdown the claims. 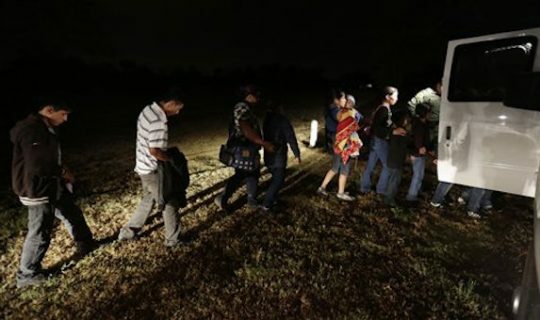 The Associated Press reported Friday morning that an 11-page draft memo called for the mobilization of the National Guard to round-up undocumented immigrants across 11 states. Four of the states listed border Mexico — California, Arizona, New Mexico and Texas. The remaining seven states — Oregon, Nevada, Utah, Colorado, Oklahoma, Arkansas and Louisiana — neighbor those four. Governors in those 11 states would make the ultimate decision as to whether their guard troops would participate, according to the AP. The memo is addressed to the then-acting heads of U.S. Immigration and Customs Enforcement and U.S. Customs and Border Protection. This entry was posted in Issues and tagged Donald Trump, Illegal Immigration, Immigration. Bookmark the permalink.